Invictus is the best security training in the state and many residents of Riviera Beach choose our security school to obtain their security license. The security guard classes prepare students with the skills required to work private security in Florida. The security guard training is a 4 day security course program that we offer every week Monday-Thursday and on Weekends. Contact is today to sign up for the security class and obtain the unarmed security d license today! Invictus offers both the armed security training and the unarmed security classes at our security training school. Many students also obtain the gun license to work armed security. The gun class is offered every weekend at our armed security school. 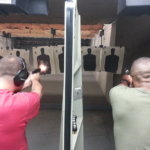 The firearms training is the best in the state and also qualifies students for the Florida concealed weapons license. Learn more about our gun training today at Invictus. Invictus students come from Riviera Beach and all over Palm Beach County. Our students are from the following cities: Boca Raton, West Palm Beach, Boynton Beach, Delray Beach, Wellington, Jupiter, Palm Beach Gardens, Lake Worth, Royal Palm Beach.